Judging the quality and value of pearls is not an easy task. The multitude of pearl types and grading standards can overwhelm even the informed consumer. The best way to go about it is to concentrate on the following quality factors. Luster is the most important quality factor and is the light reflection from a pearl. It is the deep glow from within and the mirror like reflection on the surface that is unique to pearls. High quality pearls are bright and shiny and your reflection in the pearl should be distinct and clear. Low quality pearls exhibit a chalky and dull appearance, with weak reflections. Nacre quality determines the luster of a pearl, and pearls with thick and healthy nacre have the highest luster. Only pearls with extraordinary levels of luster are selected for Mikura and we always recommend never to compromise on luster. Surface texture is the skin of the pearl and an important characteristic. 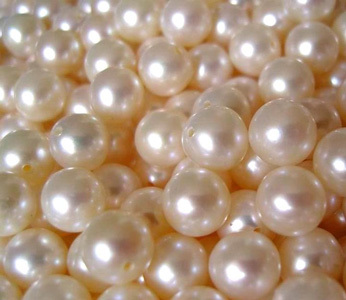 The surface of high quality pearls should be clean and smooth and free of blemishes and marks. Subtle blemishes and tiny marks that do not detract from the overall surface texture are common and are part of a pearl’s natural texture. They usually occur when sea particles drift into an oyster and brush against the pearl as it forms. Pearls with a smooth and blemish free surface indicate a high quality pearl and are more valuable. Pearls are available in a wide color palette, and color is more a matter of personal preference then quality. Always look for pearls that have a deep and even distribution of color and this denotes a higher quality and hence more valuable pearl. The value of a color is in its combination of rarity and popularity. Some colors like peacock green and golden are naturally rare and hence more valuable, while white and pink rose colors are extremely popular for Akoya, South Sea and Freshwater pearls, driving up their value. Pearls are available in many unique shapes from the classic round and drop to more contemporary baroque shapes. Perfectly round pearls are the rarest, most desired and most expensive shapes across all pearl types. Innovative designers will often create jewelry using drop, oval and baroque pearls, creating an unconventional look at a more affordable price. Quality is not necessary dictated by the shape of the pearl; some highly prized baroques are known to exhibit truly extraordinary levels of luster. Size as well has little bearing on the quality of pearls, but has a major effect on the price. Large pearls are difficult to cultivate, with oysters often rejecting large nuclei, this rarity drives up the value of large sized pearls. A pearl’s size is expressed in terms of its diameter, which is measured in millimeters (mm). Pearls can be smaller then 1 mm and as large as 20 mm. Matching is extremely important in a necklace, bracelet or pair of earrings. Due to the inherent nature of pearls, no two pearls are alike and there was will always be minute differences in shape, size, color and luster between two pearls. Yet it is extremely important to carefully and expertly select the right pearls to set in a necklace, bracelet or pair of earrings to maintain the uniformity of each. Ideally, pearls should blend homogeneously into a piece of jewelry and should not stand out due to their physical differences. A well matched necklace, bracelet or pair of earrings is the mark of a high quality piece of pearl jewelry and represents the expertise and quality of the brand behind it. It is usually only in the capacity of those specialized in pearls and with the resources to execute true high quality matching. This reflects in the costs of high quality pearls, as the matching process can sometimes involve selecting just two evenly matched pearls from an assortment of more then one thousand pearls. The higher the quality of pearls used in the matching process, the more difficult it gets, as the supply of high quality complementary pearls is extremely limited compared to more sub-standard pearls which are readily available.